Post subject: Re: War of the Spark (Set on Ravnica) Flavor Thread. - Confirmed walker deaths: Joining Dack are.... Gideon( ) and Domri. Wow, much stakes was raised only for this to be the result. - Vraska's memory alteration was reverted off-screen by someone from the Golgari. 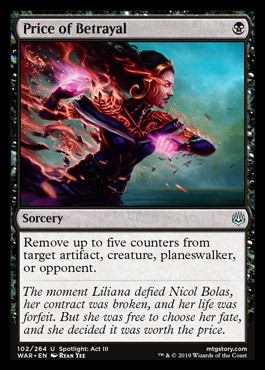 - Bolas ends up sparkless. Is now being kept under watch by Ugin in the Meditation realm. To point 1... not entirely unanticipated. To point to, boo. 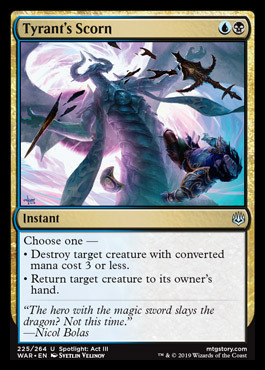 To point 3, mega boo unless this is a setup for him to eat ugin for a replacement spark to make his resurgence into the multiverse. To prior point, I'm with Barinellos... I like Saproling tokens and zombie tokens just fine but character tokens? If they're written well they're written well but if tokenism is the reason they basically never are. Sounds super meh. Not sure i want to read that book now. The Vraska part is a bit disappointing, but convincing someone that you didn't just pick up her Ixalan memories and prepared a brainwashing ahead of time would take a lot of hand-waving. ngl I'm incredibly skeptical of the book spoiler, especially the parts where Chandra's Triumph and Desperate Lunge are actively misleading the playerbase about the events of the story. At least not until there's a card for each of them depicting that they're both a ruse. But also the one where they just take a dump on half of the buildup they did on Ixalan. I can't read this, but I'm sure it's hilarious. The only deaths are the least popular characters in crowded color combo slots. Bleh... That's as lame as when you realize RW characters maturing somehow means they become GW in Magic-ese. So the War of the Spark Novel was released already in some countrys via Amazon. This is what happen there, this are mayor spoilers about the war and all the stuff happening there. Do not read beyond this if you want to follow the official storytelling. • Hazoret gives his spear to Samut and she let Niv Mizzet use it. Niv kills some Zombie Gods, but no Bontu. • Meditation Realm is now a Prision for Ugin and Bolas for eternity, none can leave or planeswalk there anymore. Just as disappointing as I thought it would be.